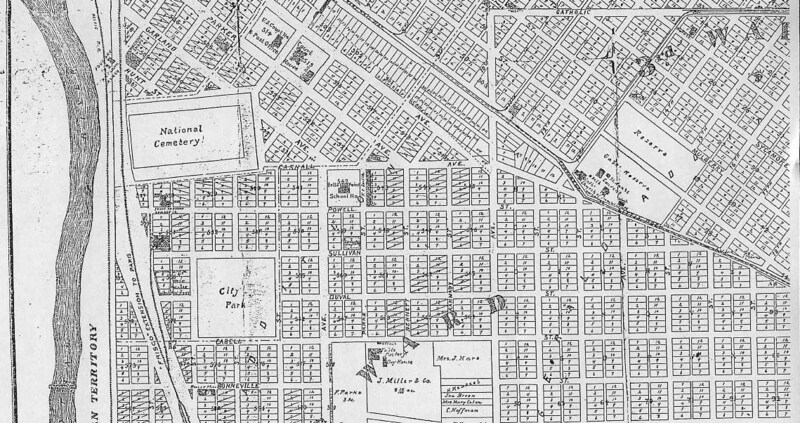 Section 3 of this 1894 map of Fort Smith depicts the western portion of what was then central Fort Smith. At the corner of Wheeler and Carnall avenues, the original Belle Point School House stood. The construction of school buildings was paid for with the sale of excess land from the "federal reservation." This was land beyond the confines of the fort that was owned by the federal government. The National Cemetery is an example of some of the land the feds retained. Carnall was named for John Carnall, one of the first teachers in the city and an important figure in real estate development. "City Park" can be seen here just south of the National Cemetery in what looks to be the land that later went to make up Andrews Field and is now being incorporated into the cemetery. South of the park, a street once honored explorer and military officer Benjamin Bonneville. Finally, take note of how as Grand Avenue enters downtown it becomes "Catholic Avenue."